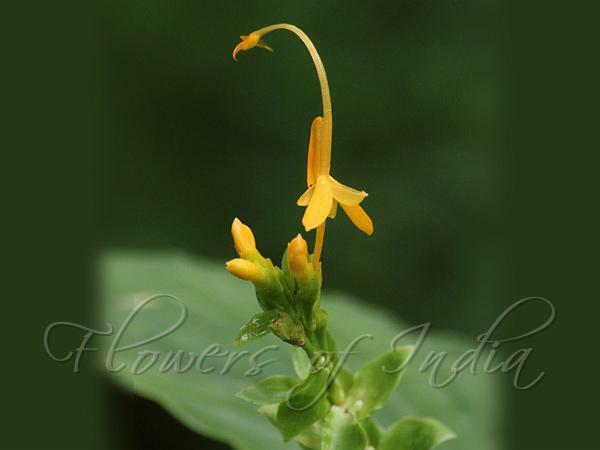 Maranti's Swan Flower is an erect rhizome forming herbs, with slender stem up to 50 cm tall, usually solitary. It is named after Itanlian botanist Bartolomeo Maranti (1500-1571). Leaves are bifarious, to 20 x 5 cm, oblong-lanceshaped, pointed at tip, stalkless, hairless. Flowers are borne in spikes at branch-ends, up to 10 cm long, often with bulbils towards the base. Bracts are 1-2 cm long, broadly ovate, greenish; bracteoles 1 cm long, ovate. Flowers are single formed in each bract. Calyx is 5 mm long, funnel shaped, 3-lobed. Flowers are 1.4 cm long, tube slender, petals short, yellow; lip as long as the flower, deeply 2-lobed, yellow; stamen 1, anthers broadly winged; lateral staminodes oblong; ovary 1-celled; ovules many on 3-parietal placentas; style 1, slender; stigma top-shaped. Capsule 1 x 6 mm, oblong, hairless, coarsely rugose. 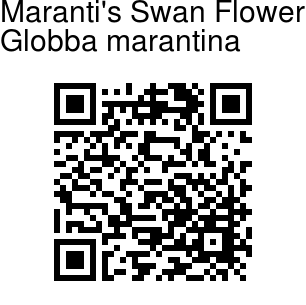 Maranti's Swan Flower is found in Indo-Malesia. In India it is found in Kerala and Tamil Nadu. Identification credit: S. Jeevith Photographed in Mudumalai reserve forest, The Nilgiris, Tamil Nadu.